PASADENA, Calif.—It has been 25 years since scientists discovered the first high-temperature superconductors—copper oxides, or cuprates, that conduct electricity without a shred of resistance at temperatures much higher than other superconducting metals. Yet no one has managed to explain why these cuprates are able to superconduct at all. Now, two Caltech chemists have developed a hypothesis to explain the strange behavior of these materials, while also pointing the way to a method for making even higher-temperature superconductors. A value known as the maximum Tc indicates the highest temperature at which a material can superconduct. The superconductor used in MRI—the metal alloy niobium tin—has a maximum Tc of -248˚C. Cooling this material to such a frigid temperature requires liquid helium, a scarce and extremely expensive commodity. But the cuprates are different. They still operate well below freezing (the highest of the high-temperature superconductors, a cuprate created in 1993, has a maximum Tc of about -135˚C), but some can be cooled using liquid nitrogen. This makes them much more practical, since liquid nitrogen is plentiful and its cost is about a hundredth that of liquid helium. "But to take superconductors to the next level, we need to understand how the known high-temperature superconductors work," says William Goddard III, the Charles and Mary Ferkel Professor of Chemistry, Materials Science, and Applied Physics at Caltech. "After the publication of more than 100,000 refereed papers on the topic, there is still no acceptable explanation, and indeed, there has been no increase in Tc for the last 18 years." All superconducting cuprates start as magnetic insulators and are transformed into superconductors through "doping," a process that involves removing electrons from the parent compound, either by substituting certain atoms for others or by adding or removing oxygen atoms. Still, no one knows what it is about doping that makes these cuprates superconduct. Over the last four years, Goddard has published three papers with Jamil Tahir-Kheli, a senior staff scientist at Caltech, building a hypothesis that explains what makes cuprates superconduct. They have been working with a cuprate in which strontium (Sr) atoms are the "dopant atoms," replacing lanthanum (La) atoms. Based on modern quantum-mechanical calculations, Goddard and Tahir-Kheli found that each dopant atom creates a four-center hole on the copper atoms surrounding the strontium, a unit they refer to as a "plaquette." Electrons within the plaquettes form tiny pieces of metal, while those outside the plaquettes are insulating and behave like magnets. This result was completely contrary to the assumptions made by most other scientists about what happens when dopant atoms are added. The problem was, the researchers still did not know how the holes in the plaquettes led to superconductivity. It took Goddard and Tahir-Kheli five years to figure that out. Their hypothesis is that when enough dopant atoms are added, the plaquettes are able to create a percolating pathway that allows electrons to flow all the way through the material. 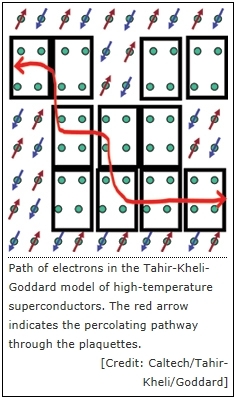 The magnetic electrons outside the plaquettes can interact with the electrons traveling through the plaquette pathway, and "it is this interaction that leads to the electron pairing—the slight attraction between electrons—that in turn results in superconductivity," Tahir-Kheli says. The researchers' latest paper, published earlier this year in the Journal of Physical Chemistry Letters, takes the hypothesis a step further by accounting for a mysterious phase seen in cuprate superconductors called the pseudogap. In all superconductors, there is a superconducting energy gap, which is the amount of energy required to excite an electron from the superconducting state into a higher energy level not associated with superconductivity. This energy gap vanishes at temperatures above which a material no longer superconducts—in other words, above Tc. But in cuprate superconductors, there is a huge energy gap that persists at temperatures far higher than Tc. This is the pseudogap. Among scientists, there are two camps on the pseudogap issue. One says that the pseudogap is connected somehow to superconductivity. The other insists that it is not connected, and in fact may be a phase that is competing with superconductivity. Goddard and Tahir-Kheli's theory lands them in this latter camp. "We believe that the pseudogap is decreasing the material's superconductivity," Tahir-Kheli says. "And, once again, its origin is related to the location of the plaquettes." Goddard and Tahir-Kheli explain the pseudogap by pointing to plaquettes that do not contribute to superconductivity. These plaquettes are isolated; they do not have any other plaquettes directly next to them. The researchers found that there are two distinct quantum states with equal energy within these isolated plaquettes. These two states can interact with nearby isolated plaquettes, at which point the two distinct quantum states become unequal in energy. That difference in energy is the pseudogap. Therefore, to determine the size of the pseudogap, all you need to do is count the number of isolated plaquettes and determine how far away they are from one another. "The electrons involved in the pseudogap are wasted electrons because they do not contribute to superconductivity," Goddard says. "What is important about them is knowing that, since the pseudogap comes from isolated plaquettes, if we were to control dopant locations to eliminate isolated plaquettes, we should be able to increase the superconducting temperature." Goddard and Tahir-Kheli predict that by carefully managing the placement of dopant atoms, it might be possible to make materials that superconduct at temperatures as high as -73˚C. They note that such an improvement after 18 years of stagnation would mark a significant step toward the creation of truly high-temperature superconductors with practical implications for the energy and health sectors. The pseudogap paper, "Origin of the Pseudogap in High-Temperature Cuprate Superconductors" was published by The Journal of Physical Chemistry Letters.